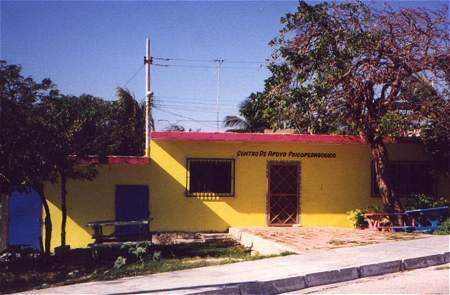 We would like to thank you most gratefully for the donations given to the Centro de Apoyo Psicopedayogico (“The little yellow school house”). We also wish to express our thankfulness for the kindness that you have shown our children. We’d like to take advantage of this opportunity to give you some information about our institution. The main purpose of this institution is to provide instruction to children with special needs. Currently there are 35 students and the numbers are growing. There are three basic groups of students. The first group does not attend public school due to mental handicaps (mental retardation, Down syndrome, etc.). These students attend the school approximately 14 hours per week and the age ranges from 5 to 17 years old. The second group we call “schoolchildren”. Although they attend public school, they are handicapped with learning disabilities such as hyperactivity, attention span deficit, dyslexia, etc. Some have had to repeat the same grade or have not learned how to read. These children are between 7 to 14 years old. The majority are in primary school and they come to us between 6 hours per week. The third group, are pre-school children with physical and/or mental handicaps such as paralysis and Down syndrome. They attend 3 hours per week. The majority of the second and third groups of children present major behavior problems. About 85% of these students come from homes of alcoholics. Many are from abusive homes. We also offer a group therapy session for the parents of these children to help them better understand the needs of their families. The staff consists of myself, Paula Salas de Sulub, the director. The three teachers, Esther, Mariso, Claudia and Viciente, each receive a modest salary for the hours they spend with our children. The school is supported by donations, attendance is free. The school was built with the help of The Mission of Love Foundation, a nonprofit organization that provides humanitarian aid to those in need throughout the world, especially children. We have finally completed the inside of the second room of the school! Ramiro Coral (Engineer) helped us get the project off the ground and the Avalon Group helped us complete it. Most of all, it was thanks to monetary donations and the finds raisers that we have been able to continue with this project. Our next challenge is to finish the exterior of the building and construct a small playground with slides, swings, etc. If you would like to help but are not able to donate supplies or money, please say a prayer for each one of our children. If you would like to help us, please make checks payable to: Amor a la Niñez A.C. Thanks to your donations we have an amble supply of colored paper, crayons, pencils and paint! Please make checks payable to: Amor a la Niñez A.C.
Amor a la Niñez A.C.
Once again we would like to thank you for your continued support! !